Today i will discuss basic difference between as-override and allowas-in command & which are configure which router. These two functions are pretty similar, just with subtle differences. They can be used in an environment where a customer is using one AS number for many sites that are connected to an ISP. This is shown in the example below. You can see that AS 65001 connects to the ISP at two locations. So when R2 receives the prefix 99.99.99.99/32, he will see that the AS path is via 1, 65001. Because of the loop prevention mechanism, R2 will have to reject this prefix because it can see its own AS in the AS_PATH attribute. I’ll demonstrate that now. But first, I’m going to post the full configurations because this can be pretty confusing to configure. So currently, on R2, he is not accepting any prefixes from R1 in the other site; as shown below (we would expect the 10.10.10.0/24 and 99.99.99.99/32 networks to be in the BGP table). The debug below shows why he’s not accepting these prefixes. One way to fix this is to use the allow-as-in command. This allows R2 to override the loop prevention mechanism by allowing an instance of AS 65001 to be in the AS_PATH. Let’s do that now. So you can see (on R2) that the AS_PATH is 1, 65001 for these prefixes. It keeps all the AS_PATH information and simply just allows 1 occurrence of 65001 to be in the AS_PATH; thus overriding the loop prevention mechanism. We would obviously need to do this on R1 in order for R1 to have reach ability to the 20.20.20.0/24 prefix (sitting between PE2 and R2) so that he can have a route back to R2. 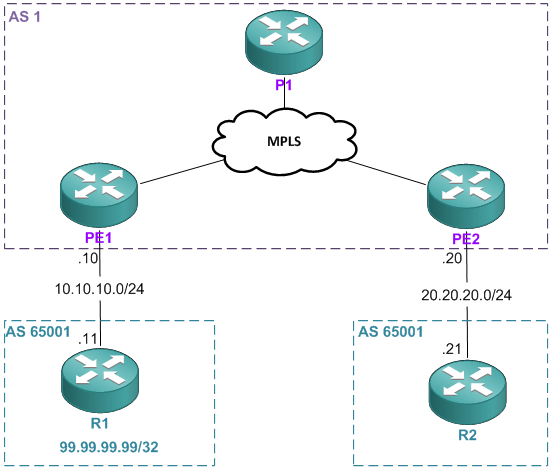 The other way you can complete this task is by getting PE1 & PE2 to just strip AS 65001 from the BGP UPDATE before sending it to the customer edge routers. Let’s do that now. By configuring this command it actually resets the peer, so there’s no need to clear any neighbors. The result of this is shown on R2 below. So the AS_PATH has been overridden by the PE routers to their AS number instead. This is the key difference between the two commands. Allowas-in allowed the loop prevention to be ignored for the configured amount of instances, and the as-override caused the PE routers to modify the AS_PATH.